Cover song time! I'm a fan of good (and sometimes bad) covers of pop tunes by global artists. I've come to expect the unexpected, though I have to admit that this one took me a bit by surprise. 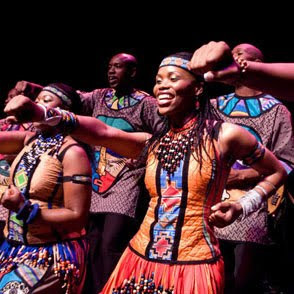 The Soweto Gospel Choir hasn't shown an aversion to covering other people's songs... they've recorded "Bridge Over Trouble Waters," "Ave Maria," "One Love," "Amazing Grace." So perhaps you see a trend here...they tend to cover songs from a sacred tradition. Okay, the Simon & Garfunkel cover wasn't sacred, though it's certainly inspirational (and inspired a gospel-flavored cover by Aretha Franklin). That set the precedent, I suppose, for this cover of the feel-good 1985 pop hit by Katrina and the Waves.